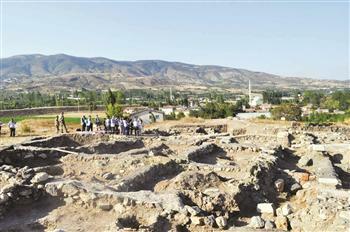 TURQUIE – Tripolis - Archaeologists working on the ancient city of Tripolis in the Aegean province of Denizli have uncovered a 1,600-year-old house complete with a rich set of mosaics. “When we removed the earth, we saw that the structures underground had survived. They are in very good condition. We have found the agora and a columned gallery as well as stores. Unexpectedly, we found a house covered with mosaics. The house is fully covered with mosaics, and they were very well-protected. There is little damage to the mosaics,” Denizli Gov. Abdülkadir Demir recently told Anadolu Agency. The head of the Tripolis excavations, Pamukkale University Professor Bahadır Duman, said they were currently working on the agora. “The house has seven or eight rooms, and its floor is covered with colorful mosaics with herbal and geometric designs. This is why we think that a wealthy family of Tripolis was living in this house. Although it was constructed in the fourth century A.D., the house was also used in the fifth century A.D. People living in this house were not ordinary people; they were very influential,” Duman said. Archaeologists, however, have determined that human settlement in the area dates back to the third century B.C. The archaeological excavations have been carried out for two years by Pamukkale University in Tripolis, which was located at the junction point of Phrygia, Karia and Lydia in the Hellenistic period. The city was surrounded with walls in the early Roman period. In last year’s excavations, geo-radar work revealed a marketplace in good condition. 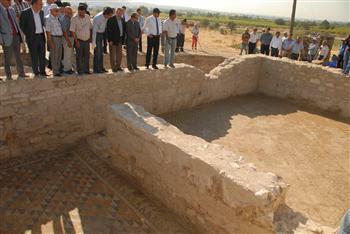 One of the most important findings in 2013 was a church from the early Byzantine period in the sixth century. The soil in the church has been removed, and its roof will be covered with a wooden material as per the original before being opened to visitors. ROYAUME UNI - Inveresk - The National Trust for Scotland is holding a community archaeological dig at Inveresk Lodge Garden near Musselburgh next month. As part of East Lothian Archaeology and Local History Fortnight, volunteers of all ages are being invited along to the banks of the River Esk, the scene of the Battle of Pinkie, September 10, 1547. 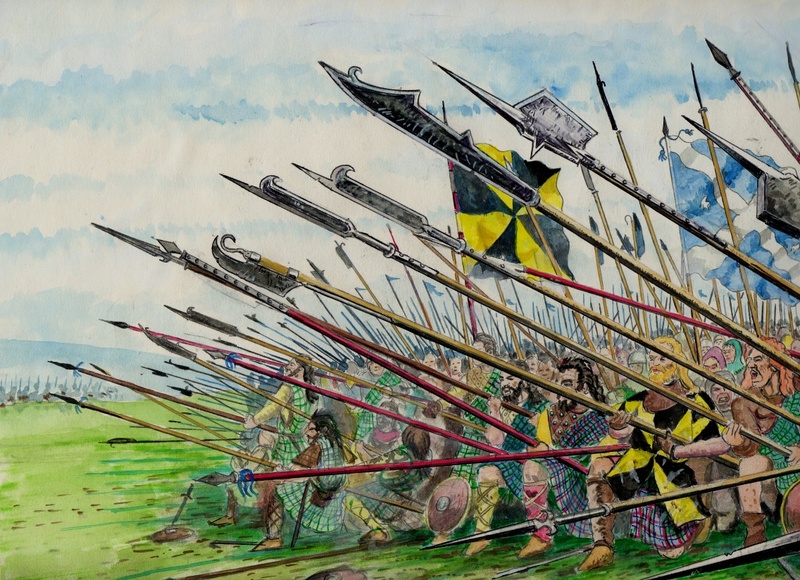 The dig will attempt to unearth physical evidence and artefacts remaining from the battle, when Henry VIII’s English forces virtually destroyed a Scottish army of 23,000. Henry’s goal, which he failed to achieve, was the forced marriage of his son, the future Edward Vl, to Mary Queen of Scots. Daniel Rhodes, group archeologist for the Trust, said: “Inveresk Lodge Garden is directly behind the line of the advancement of the Scottish troops and their eventual retreat and slaughter. BULGARIE – Perperikon - Archaeologists working on Bulgaria’s Perperikon site have found the skeleton of a male buried with a ploughshare in its chest, a find that professor Nikolai Ovcharov has already described as a “twin of the Sozopol vampire.” This appears to be the first find of this kind (or the first publicised one, at least) at Perperikon – a treasure trove that archaeologists are still not finished exploring after more than a decade of digging, given that the site has been inhabited since the early Iron Age well into the medieval era. Coins found with the body have been tentatively dated to the 13th and 14th century. The skeleton appears to belong to a male aged 35 to 40, Ovcharov said. “I say that he is almost a ‘twin’ of the Sozopol [vampire] because on the left side, between his neck and chest, there is a massive ploughshare. In other cases we have found nails and spikes, but there is no other known case, except the one in Sozopol, where a ploughshare was used. It is a ritual to prevent undeath,” Ovcharov said. 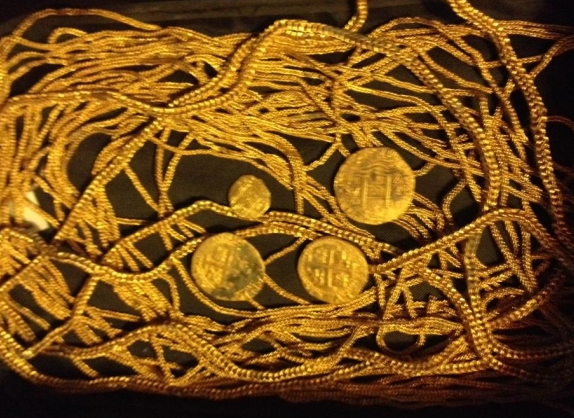 USA – Fort Pierce - Treasure hunters have discovered 300-year-old Spanish gold chains and coins valued at $300,000 off of the coast of Florida. The hunters, the Schmitt family and a diver named Dale Zeak, found the gold during a sea scavenge 150 yards off the coast of Fort Pierce. Sixty-four feet of thin gold chain, five gold coins and a gold ring were discovered in the water, the Orlando Sentinel reported Tuesday. The family, which runs a company called Booty Savage, said this was their biggest haul yet. The gold belonged to 11 Spanish ships, of which 10 sank during a hurricane in 1715, giving the area the nickname "Treasure Coast." 1,000 people died in the storm, according to the Orlando Sentinel.